Honda’s very popular Crosstour is a bit of a mystery, slotting into the full-size crossover class, but looking more like a wagon or hatchback. The vehicle was originally created as an alternate body style for the Honda Accord, and still maintains its classy look, but is now part of its own model line with vastly increased storage space and flexibility. The Honda Accord Crosstour was designed to capitalize on a new trend for fastback-style passenger vehicles. Honda increased the ceiling of the Accord sedan and added quite a bit more room in the back. These models still had the sophistication of the Accord, but were better for drivers who needed more cargo room. These were definitely luxury-centered models with features like leather upholstery, Bluetooth connectivity, navigation, and a rearview camera spread across two trim levels (EX and EX-L). Models were quite powerful and came with a 3.5L V6 capable of 271 hp. They could do 0 to 60 mph in a pretty fast 7.5 seconds. All-wheel drive was available for these cars, so they also made for solid winter vehicles. Honda dropped the Accord from the Crosstour’s name in 2012. They didn’t radically alter the vehicle but Bluetooth, a rearview camera, and iPod connectivity became standard. The automaker also gave drivers the option of a smaller 2.4L four-cylinder capable of 192 hp and 162 lb-ft of torque, which offers better fuel economy than the returning V6. 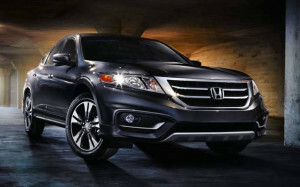 In 2013, Honda gave the Crosstour a major updated with refreshed styling inside and out. They also added a new 3.5L V6 capable of a faster 278 hp and 252 lb-ft of torque and a six-speed automatic transmission for it. Fuel efficiency also improved with both engines. Brilliance Honda is a short drive from Elgin, Barrington, and Schaumburg at 680 West Terra Cotta in Crystal Lake. At our dealership we carry both new and used Honda Crosstours depending on your needs. Visit Brilliance Honda soon and take a test drive in one of them!